The Data Connect V3600 is a series of high performance, synchronous and asynchronous, full-duplex, multi-standard standalone or rack-mounted modems. It is designed for use on 2-wire dial-up and 2/4- wire leased-line circuits. The Data Connect V3600 is fully compliant with ITU-T V.34 recommendation as well as being compatible with ITU-T recommended V.32bis/V.32, V.22bis, V.23 and V.21 international standards while operating at 33600, 31200, 28800, 26400, 24000, 21600, 19200, 16800, 14400, 12000, 9600, 7200, 4800, 2400, 1200, and 300 bits per second. An in-band secondary channel allows the user to monitor and control the remote site unit. The Data Connect V3600 series also offers auto callback and leased-line security checks in addition to the dial-up security checks. 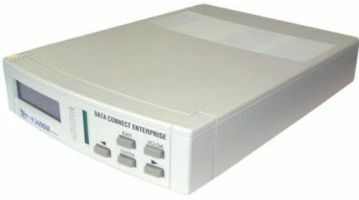 The Data Connect V3600 is a series of high performance, synchronous and asynchronous, full-duplex, multi-standard standalone or rack mounted modem. It is designed for use on 2-wire dial-up and 2/4- wire leased-line circuits. The Data Connect V3600 is fully compliant with ITU-T V.34 recommendation as well as being compatible with ITU-T recommended V.32bis/V.32, V.22bis, V.23 and V.21 international standards while operating at 33600, 31200, 28800, 26400, 24000, 21600, 19200,16800, 14400, 12000, 9600, 7200, 4800, 2400, 1200, and 300 bits per second. In V.34 mode the Data Connect V3600 provides full-duplex operation at up to 33.6Kbps on a 2/4-wire PSTN line with features like line probing, symbol rate and carrier frequency automatic selection. A range of performance enhancing techniques are available for V.34 mode, including adaptive precoding, adaptive pre-emphasis, nonlinear encoding (Warping), constellation expansion, multidimensional trellis coding, transmission power back-off (power drop), V.8 standard modem initialization and shell mapping. An in-band secondary channel allows the user to monitor and control the remote site unit. The Data Connect V3600 series also offers auto callback and leased-line security checks in addition to the dialup security checks. The rack can accommodate up to 16 modem cards with 32 ports, control unit and single or dual redundant power unit. Dual redundant power supply meaning if one power does fail, the other one is capable of powering the entire rack.